Pipe bag development and designs have been evolving steadily, in recent years. I have played most of the new synthetics and synthetic-hybrid bags. I believe that the new pipe bag, developed by Willie McCallum and Bannatyne, is the best to come along, so far. The bag has excellent gradations of moisture control, feels great under the arm, and puts the instrument just where you want it to be, after a very short “warm up”. I really love the new pipe bag and will recommend it enthusiastically, to pipers! 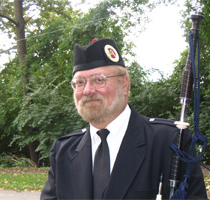 Donald Lindsay is North America’s 1st, full time professional piper. He served with the United States Air Force Pipe Band in Washington, D.C.
At 18, he won the MacDougall-Gillies trophy for piobaireachd and placed 3rd in the Marches at The Northern Meeting, becoming the 1st North American Piper to win a prize in the “majors”. In 1974, he was designated the EUSPBA Champion Professional Piper. In 1981 he established the Nicol Brown Chalice Amateur Competition. In 1985, he placed 4th in the Oban Silver Medal, and 2nd in the Inverness Silver Medal. In 1986 he was placed 1st in the Silver Medal Final at Oban. He is currently (2011) ranked 8th overall in the EUSPBA Professional Standings, and 5th in the Professional Piobaireachd standings. Lindsay co-founded the Invermark College of Piping with his father, James F. Lindsay, in Petersburgh, NY 1961. He became Director/ Resident Instructor, in 1970, and continues in that capacity. He is a member of the Piobaireachd Society, EUSPBA, and B.C. Pipers’ Judging Panels. Donald is currently an examiner for the Piping and Drumming Qualifications Board, which is certified by the Scottish Qualifications Authority. He worked with Roddy MacDonald in the 1970’s to design the EUSPBA Judge’s Training Program. He co-founded the Oran Mor Pipe Band of Albany New York. Oran Mor is currently one of three Grade I Pipe Bands in the US. Donald Lindsay has appeared on NPR, National television, as well as several recordings, including “Land of My Youth”, (Front Hall Records) and ” King’s Court and Celtic Faire” (Telarc). He teaches piping students throughout the United States, Canada, Scotland and Continental Europe, in person and via internet. His pupils are currently ranked 2nd overall in the EUSPBA Professional Piping, 1st in Amateur I and 1st in Amateur II.